The netizens are lashing out at Asianet MD K Madhavan and jury members for giving away almost all awards to either Pulimurugan or Oppam team. Viewers have been raising a few questions about the recently concluded 19th Asianet Film Awards 2017 on social media. Was it actually an award show to honour the best performers in Mollywood or Pulimurugan's success meet? Why did Nivin Pauly even attempt a "comedy" skit? How could the jury ignore movies like Maheshinte Prathikaram, Kammatipaadam and Guppy? The netizens are lashing out at Asianet MD K Madhavan and jury members for giving away almost all awards to either Pulimurugan or Oppam team without even considering Dulquer Salmaan's Kammatipaadam, Tovino Thomas' Guppy or Fahadh Faasil's Maheshinte Prathikaram. Pulimurugan won Best Actor, Best Villain, Best Supporting Actress, Popular Movie, Best Editor and Special Jury Awards. Superstar Mohanlal was also spotted performing the movie stunts live for the audience. Though many have appreciated the actor for pulling off such stunts, but some have been asking why Mohanlal is given more importance in all Asianet award shows. Except the tiger in Pulimurugan, almost all the crew, even the ones who sold the black tickets seemed eligible for Asianet Film Awards, netizens said. Even though actor Vinayakan was one of the nominees in the category for Best Supporting Actor, the award was given to Renji Panicker for his performance in Jacobinte Swargarajyam. This has irked many, who claim Vinayakan's performance in Kammatipaadam makes him deserving for even Best Actor category. "Was Manju Warrier deserving to win the Best Actress award for Karinkunnam 6s and Vettah?" asks few others, who felt Sai Pallavi should have got the award. However, Maheshinte Prathikaram received few awards including Critics Award for Best Film, Best Character Actress (Anusree) and Best New Face (Aparna Balamurali), while Dulquer was accorded Critics Award for Best Actor for his performance in Rajeev Ravi's critically-acclaimed Kammatipaadam. "I do not understand why these award shows are conducted these days? These channels are just bothered about their TRP ratings and as a result awards will be given to celebs with star value. 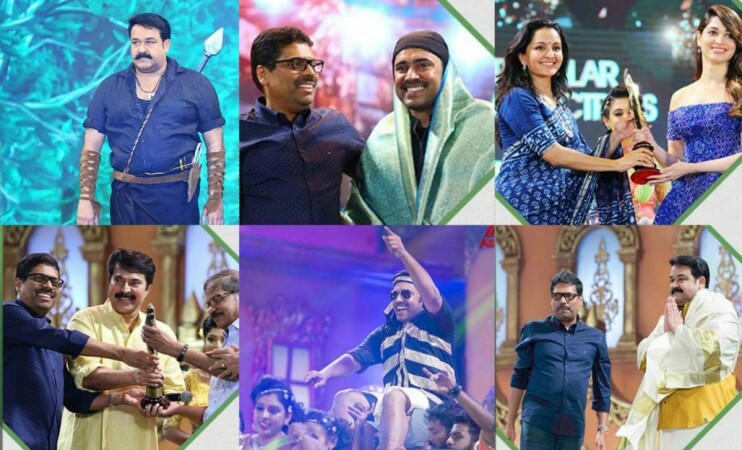 The Asianet Award show was purely Pulimurugan show with every crew member getting some award. Without honouring the best performers, what's the whole purpose of these shows?," asks Manoj Krishnan. "Last year it was Mohanlal's Lalettan at 36 that was criticised by the audience, now he has handed over the the baton to Nivin Pauly, who performed the worst skit this year. None of the entertainment programmes in Asianet Award show were "entertaining", and I couldn't watch it till the end," Amrudha Philip rued. "Thankfully I didn't waste the Sunday by watching Asianet Awards as I knew it was a flop show on the first day itself," Minu Vinu says. However, in an attempt to honor the eligible best performers in Malayalam without considering their star value, the popular Facebook page Cinema Paradiso Club has announced the winners of second edition of CPC Cine Awards 2016 with Vinayakan, Sai Pallavi and Rajisha Vijayan bagging the Best Actor awards. Meanwhile, director Dileesh Pothan's Maheshinte Prathikaram has won as many as five awards. Kammatipaadam and Guppy were also honoured. Best New Face - Aparna Balamurali and Gokul Suresh for Maheshinte Prathikaram and Mudhugauv, respectively. Popular Tamil Actress of the year: Tamanaah for Devi (L). Asianet team to Tiger: The award night is over. No award for you. Leave. Tiger: Can I take this shawl before I leave, else my wife will think I was not part of the movie. Asianet: Just show this and you will get an award. Even Tamannaah, who won the Popular Tamil Actress award was not spared by the netizens, who made fun of her blue fairytale attire. Jojo: Haven't you heard about him?